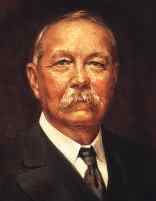 Arthur Conan Doyle was born in Edinburgh on May 22, 1859, into a large family with ancient historical roots. His education took place at home until he was sent away to a Jesuit school at the age of nine. He studied medicine at Edinburgh from 1876 to 1881. While at University and after, he took positions as ship’s doctor on voyages to Africa and the Artic. After completing his education, Doyle set up his own medical practice, and wrote in his spare time. His famous detective, Sherlock Holmes, was created and made his first appearance in A Study in Scarlet, published in 1887. He then wrote a long historical named called Micah Clarke, published in 1889, before returning to Sherlock Holmes with The Sign of Four. When the Strand magazine was created in 1891, Doyle saw it as an opportunity to revive Holmes for a series of shorter adventures. However, although the mysteries brought him success, Doyle was drawn to more serious writing and resolved to kill Sherlock Holmes. He attempted to do so in December of 1893 with The Final Problem, and afterwards wrote many other novels in various genres, but the public outcry caused him to eventually resurrect the detective for further cases. His stories were the forerunner of the great Golden Age of mystery in the 20’s and 30’s. In his later life, Doyle became a strong supporter of the spiritualist movement, and was involved with the famous Cottingley Fairy photographs. He died on July 7, 1930. It is a great thing to start life with a small number of really good books which are your very own. ...when you have eliminated the impossible, whatever remains, however improbable, must be the truth. ...chief proof of man's real greatness lies in his perception of his own smallness. A collection of stories detailing the adventures of Sherlock Holmes and Watson, including, "A Scandal in Bohemia," "A Case of Identity," "The Red-Headed League," and "The Boscombe Valley Mystery." The story of three households in England that, through money and love, are brought together. Continuation of the tales of Sherlock Holmes and Watson, focusing on the curse surrounding Sir Henry Baskerville, and the supernatural events that follow during the investigation. Follows Professor Challenger on his adventure to a world with dinosaurs. Twelve stories of Sherlock Holmes and his battles with Professor Moriarty. After returning from the adventure of the Lost World, Professor George Challenger experiences the demise of Earth after it passes through a poisonous ether. Resurrected after public outcry, story tells of Holme's rebirth and four more mysterious cases. Continuing tales of Sherlock Holmes and Watson, this time investigating the disappearance of a young woman's father. Alleyne Edricson travels to France to join a group of archers known as the White Company in 1366.